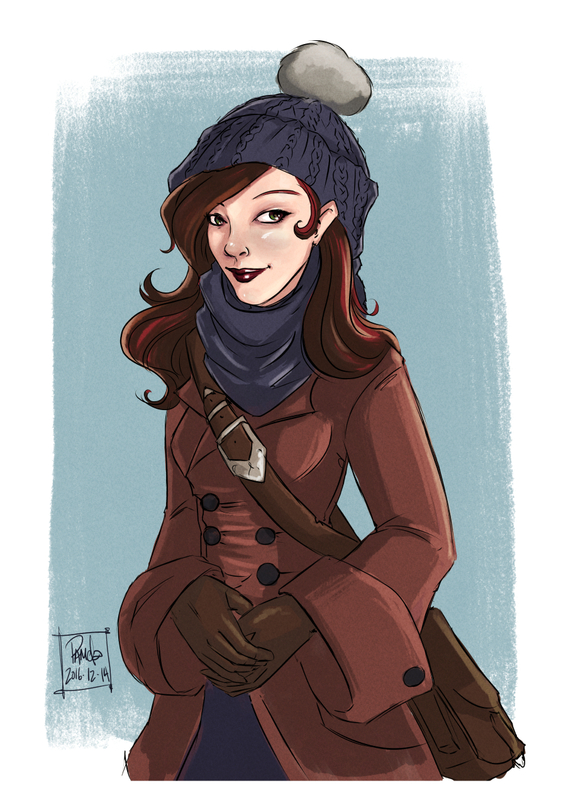 A 2 hour sketch in Clip Studio Paint to celebrate the first polar vortex of the season! Between Sims 4 and suffering from carpal tunnel syndrome and a bad back, I haven’t been drawing much. I wanted to get a whole slew of stuff done for the holidays, but that probably isn’t going to happen. I may stop using Deviant Art as a social medium for posting artwork. There is a lot of beautiful artwork there, and I’ve been introduced to many talented artists. However, the network itself seems to reward fan art or derivative art, to an extent that it’s difficult to find any one with original styles. This sounds catty, but I don’t mean it to be. I truly do love finding all sorts of different styles of art, but it’s difficult when one social network is telling me that only fan art drawn in one of three different styles is popular . Tell me in the comments if I’m totally wrong about this. I look at everyone’s work and pick through their lines and colours and see what I love about their projects. When it comes to looking inwardly at mine, I can’t help but compare, or attempt to emulate. My lines should be loose… they should be clean… my shapes should be more Disney… more anime… more realistic… more cinematic concept-y; I forget that I should maybe start with building up on my own work. I am not comfortable enough in my own lines to yet try to break out of them. Maybe instead of pushing my limits, I need to be okay with what I know. So I draw a few more portraits of fashionable girls with pretty hair, let me get that right first and then I can go forward with something epic. I don’t know what the right approach is. This is part of re-discovering talent and re-learning my art. We need to question not only ourselves, but what we see out there. Why do we like something? Can we be honest with ourselves? Is it the style, the subject, or the execution? I share my work because I like my stuff to be out there. I’ve grown to a place where I think I can be confident enough in my work, acknowledge and accept my limitations. My two hour sketches are just two hour sketches. I know they are imperfect (like seriously what’s with the buttons?!) but drawing something and completing something is the point. If I go for the epic work without having experience, without knowing my lines, I’ll never get done. So the question now is when will I feel ready to start my epic?